Aunt Oume: This must be quite a sight! I'm guiding a masseur, who's carrying my vegetables. Zatôichi: Wish I could see that! The story of the blind swordsman Zatoichi should be well known to most aficionados of Japanese cinema. I was thrilled when i heard that Takeshi Kitano (of all people) would be making a re-make of the classic series. And i was not disappointed. The blind masseur/swordsman Zatoichi stumbles upon a lone widow when he comes walking in the countryside. He helps her carry a basket and she tells him of her problems while he is invited to stay with her. The local town is plagued by a war between different criminal factions and the protection rates are constantly going up. Soon two geishas also arrive in town with their own agenda, linked to one of the warring gangs. Zatoichi is a beautiful film in my opinion. Everything from photography and scenery to music is exceptionally well tuned to the mood of the film. Also the action sequences are very well made, the fencing well choreographed and nicely shot. What distracted me somewhat though is the use of liquid animation for the blood. There is almost no usual fake blood in this movie, rather it's liquid animation-blood spraying when people are stabbed. This looks odd, but it's still a minor distraction. 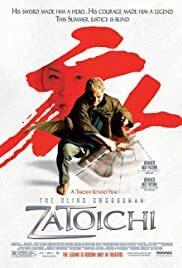 Zatoichi feels both like a nice tribute to 60's and 70's samurai-films as well as a fresh take on the genre. Both modern and classic, which is one of the finest compliments i feel you can give a movie like this one. I enjoyed it very much and i rate it 7/10. 70 of 87 people found this review helpful. Was this review helpful to you?